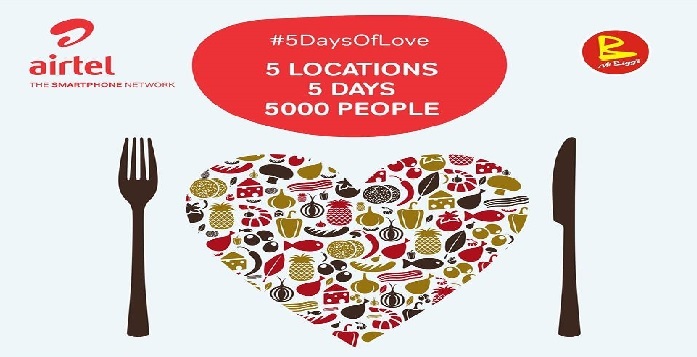 The Christmas season is here again and we have the 4th edition of Airtel 5 days of Love with the tag #5daysoflove. Airtel Nigeria has kicked-off its 2018 Christmas programme tagged: ‘Airtel Five Days of Love’ to identify with and empower less privileged persons in communities where the telco operates. Since the commencement of the initiative four years ago, Airtel has held different outreach programmes, especially its feeding programme, which over 10,000 Nigerians have benefited from. According to Airtel, the ‘2018 Five Days of Love’ programme will be held in five states this week. Lagos at Ojuelegba Under Bridge on 10 December, 2018. Sokoto at Opposite Sultan Palace on 11 December, 2018. Kano at Gyadi Primary School on 12 December, 2018. Ibadan at Sango Tipper Garage on 13 December, 2018. Port Harcourt at Isaac Boro Park on 14 December, 2018. Airtel Ng will be feeding over five thousand Nigerians in all locations above. Through the ‘Five Days of Love’ programme, we will be sharing the reason for the season –love– and celebrating with the underprivileged by providing quality, hot meals amidst an electrifying atmosphere of fun, good entertainment and love. Airtel NG is committed to touching the lives of the needy in the society and empowering stakeholders in the communities where it operates.